Now You Can Book A Cab Ride With Google Assistant. Remember those moments where you were in a hurry to rush over to the office to avoid the trouble of getting late, followed by the hassle to then getting in your car & again entering the details on your phone for navigation... A lot of time wasted right? This entire hassle reduces if you have let's a smart speaker like Google home, in such a case, you can easily say, "Hey Google, send me directions to XYZ on my phone", next thing you know while unlocking your phone is all you need to tap on start the navigation. 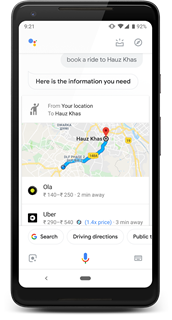 Similarly, today Google is extending their services to book cab rides directly from your google assistant integrating the supported cab services from your area. Just pull out your phone and say, “Hey Google, book a ride to the Bluebird Cafe” or “Hey Google, get me a taxi to Indira Gandhi International Airport.” and it'll show relevant cab ride options with the estimated pricing, wait times and more from every option shown as a cab ride(Uber, OLA, Meru, etc.). If you want let's say a specific cab ride from a specific provider, ask for it. It will be something like, “Hey Google, get me an Ola ride to Gateway of India” or “Hey Google, get me an Uber ride to Gateway of India.”. The same services can be accessed when leaving to your commute via your Google Home, where the Google Assistant will show the relevant options on your phone, provided you're using the same Google account. Once you have got your preferred cab service, select it, so that the corresponding app would open up to complete the later process. These features are rolling out in the English Language first and would be available in limited countries to begin wherever Google has one of their supported ride service partners. Google plans to expand these services to many more languages in the coming months. Convenient functions like these would be beneficial while heading out to anyone's party or family dinner where we usually are always in a rush. Also See: You Can Now Use Google Pay(Formerly Tez) To Pay For Your Uber Rides In India.